Edmison in the Lister at Pomona in 1963. The bright yellow car had enormous power from its 6065cc. engine, but numerous problems kept it from ever making a competitive run. Bob Bondurant also tried tried the car in practice, but didn't race it. 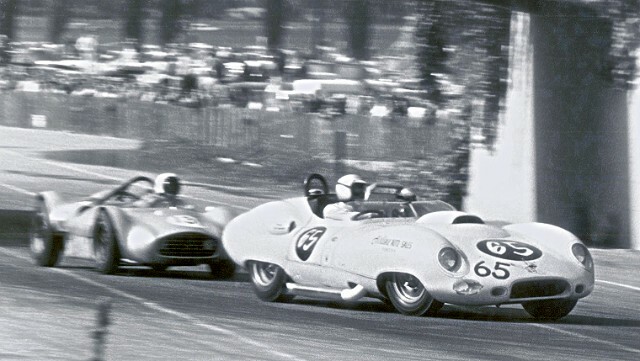 Here Edmison leads Jim Parkinson in the mid-engined Campbell-Chevy. This potent car was rebuilt after Bob Harris's spectacular accident at Santa Barbara on Sept. 2, 1962. Good to hear from you again. The Lister was purchased by Dan Whitz alone (Kozlosky went into the service). The car was originally scheduled to be driven by Stirling Moss with a Maserati engine installed. I think the rear engine revolution scrapped those plans. A 402 cubic inch Chev. was in it when Dan bought it. Lefty Mudersbach put one of his drag race motors in it. The engine had a four inch bore and a four inch stroke (we called it a four by four). The crank was made by Moldex from a solid billet (I still have it). My memory isn't getting any better but I think we only roadraced it once or twice. I drove it once at Pomona and called Bondurant to drive it at Pomona the next time. We had a sprint car race at the same time and I couldn't drive both. We drag raced the car a lot and did well with it. The car turned 132+ in the quarter. The E.T. wasn't very good as it was set up for road racing. Chet Herbert advertised it as the fastest un-blown sportscar in drag racing. The main problem we had was with the oiling system. We were using only one scavaging pump in the dry sump system at that time. The crankcase would fill with oil and blow it all over the back tires. Dan sold the car without the engine. I put the engine in the new sprint car that I was just finishing. Solved the oiling problem and ran the engine until 1969. I enjoyed the photograph. Was recently talking about that little car behind me. I think on the next lap he went by me in the same spot so sideways that I thought he'd never make it. The Campbell-Chev. was co-owned by Dan Blocker, I think. Lister today in historic racing events! All photographs and text are the property of Allen Kuhn and Tam McPartland and are protected under United States and international copyright laws. All rights are reserved and the images and/or text may not be digitized, reproduced, stored, manipulated, and/or incorporated into other works without the written permission of the photographer, Allen Kuhn, or the writer, Tam McPartland.